Keurig coffee makers offer the chance to brew a single cup of the perfect beverage. However, this means that the machine generally reserves one cup of water for fairly rapid brewing. If you put milk in the reservoir you'll wind up with spoiled milk trapped in the reservoir. Check out our guide on how ﻿﻿to get water out of a Keurig to start the cleaning process right away. If you really like frothed milk beverages and coffee additions, you can invest in other tools that will warm milk without rotting your coffeemaker from the inside out. For example, the Keurig Cafe One-Touch Milk Frother is an ideal tool for warming milk and is easy to empty fully and clean. Of course, one of the handiest things about a Keurig coffee maker is that you can leave water standing in it for the next brew. Milk, unfortunately, doesn't tolerate being left at room temperature for a long time and will spoil. 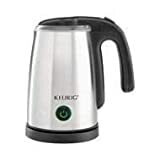 You will need to add fresh, cold milk to whatever warming tool you use prior to frothing or heating your milk and not in your Keurig's water reservoir. If someone has already tried to make the perfect latte or hot cocoa by adding milk to the water reservoir, you'll need to get out your manual and take the coffeemaker apart to get all of the liquid out of it. If you notice a strong odor immediately following the addition of milk to your Keurig, be aware that that odor comes from burning, not from spoiling. Burned milk can often be taken up with steel wool on external surfaces, but it may not be possible to access the internal components of your Keurig. Your Keurig reservoir is extremely useful in rapidly brewing a great cup of personalized coffee, but milk is not a great addition.